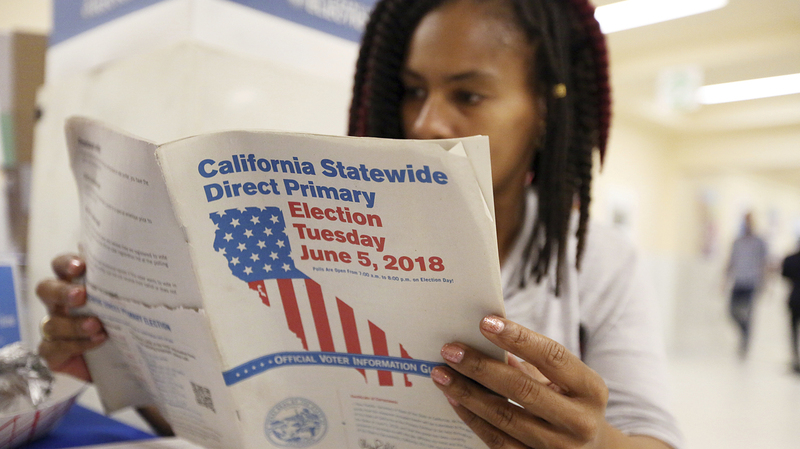 California's Primaries, Plus 5 Takeaways From Tuesday Night The party's chances of taking back the House were helped, especially with apparent results in California. That, plus four other takeaways from Tuesday night's elections in eight states. Nikko Johnson reviews the California Primary election guide at San Francisco City Hall on Tuesday. Tuesday night's results by no means mean taking back the House is assured for Democrats. In fact, indicators have moved the other direction over the past several months. But Tuesday night could have made things far worse – and they didn't, which means Democrats have to be breathing a sigh of relief. Going into Tuesday's primaries, the big story to watch was the key House races in Southern California. Because of its primary system, in which the top two vote-getters advance to the general election regardless of party, Democratic operatives were concerned that the party could get shut out in places it needs to compete in this fall. Despite the large number of Democratic candidates who split the vote in some districts, it appears to be on track to put Democrats on the November ballot in each of those races, although final results are not yet known and might not be for several days. In California's 39th district, the district Democrats were most concerned about beforehand, not only did a Democrat advance, but Washington operatives' preferred candidate, Gil Cisneros, made it through. The district is one of seven held by the GOP that Hillary Clinton won in the state. Its unique demographics make it a real target for Democrats. The district is majority nonwhite – Latinos make up a third of residents while Asians make up slightly less than that. Democrats advanced Cisneros, who is Latino, and Republicans put through a vaunted candidate of their own, Young Kim, who finished first (slightly ahead of Cisneros) and is Asian. It was a tight race in California's 48th district. Who makes it through will likely take some time to figure out. The top spot went to incumbent Dana Rohrabacher, whom Democrats see as very vulnerable. Currently, two Democrats are separated by just 73 votes out of 105,000 total cast. And a Republican is just 1 percentage point behind them. But for the second straight election, Republicans could not get a candidate through to the general election for the Senate. It means that Sen. Dianne Feinstein will be pitted against state Sen. Kevin de León, who is appealing to progressives and Latinos. Still, Feinstein enters in a very strong position, winning 1.2 million more votes than de León Tuesday night. Halfway through the primary calendar, Democrats appear to be holding up where they need to — in the suburbs. Like in California, the seats Democrats hope to pick off in New Jersey are full of affluent, suburban voters. There are four districts in particular that they were targeting, and in all of them Democrats advanced candidates whom national Democrats see as the strongest candidates. What's more, Democrats turned out at higher levels than Republicans in every single contest in the state where there was a competitive primary. Trump won three of the four big seats Democrats are targeting in New Jersey, so the party was wary of advancing candidates who might not be able to have some crossover appeal. But so far, with the exception of Nebraska's 2nd Congressional District, Democrats are putting forward candidates who match the districts they're running in. Republicans also got their preferred candidate in a New Jersey House race against a freshman Democrat, Josh Gottheimer. It was a district Trump won in 2016. It's important to remember that this year may be different than past potential wave years, because it's not all headed in the same direction. That could be evidence of a continuation of a political reformation in the United States. In New York, which has its primary at the end of this month, Democrats are targeting about half a dozen upstate districts, but all of them went more for Trump than they did for Obama in 2008 and 2012. And Republicans are targeting similar Democratic-held seats in Minnesota, too. Up to this point in 2018, being a Republican member of Congress wasn't such a good thing. One GOP incumbent has already lost a primary and others have been denied promotions for the nomination to the Senate or for governor in Indiana, West Virginia and Idaho. But Tuesday night, two GOP members advanced to general elections for governorships in South Dakota and New Mexico. At the same time, GOP Rep. Martha Roby was forced into a runoff in Alabama after speaking out against President Trump. Roby said she couldn't vote for Trump after the Access Hollywood tape emerged. But her district went for Trump by 30 points, and she drew a primary opponent. On Tuesday, she wound up with only 39 percent of the vote and will face off against former Rep. Bobby Bright, who finished with 28 percent, or about 10,000 fewer votes. There is a catch here, though — Bright isn't a standard Republican. In fact, he hasn't been a Republican all that long. He's a former Democrat who voted for Nancy Pelosi for speaker. But Roby clearly has some work to do to get to 50 percent by the runoff on July 17, and the race will test just how short a leash a member of Congress who criticizes the president has with the base.